Appearance standards have been popping up in cities like Sioux City all over the country in the last handful of years. These are being instated to make sure residential, commercial and industrial properties look the best they can for their communities. A few of the things that are regulated in these appearance standards are garbage dumpsters, chillers, transformers, generators, condensers and mechanical equipment. You can no longer just surround your dumpster with inexpensive fencing or place them at the back of your property. Now many people must turn to double swing gate dumpster enclosures to stay up to code. Increasingly, architects and civic designers are requiring these dumpster enclosures be designed to complement the surrounding buildings and structures. In order to complement surrounding structures, the dumpster enclosures need to be made of similar materials to the exterior of these buildings. 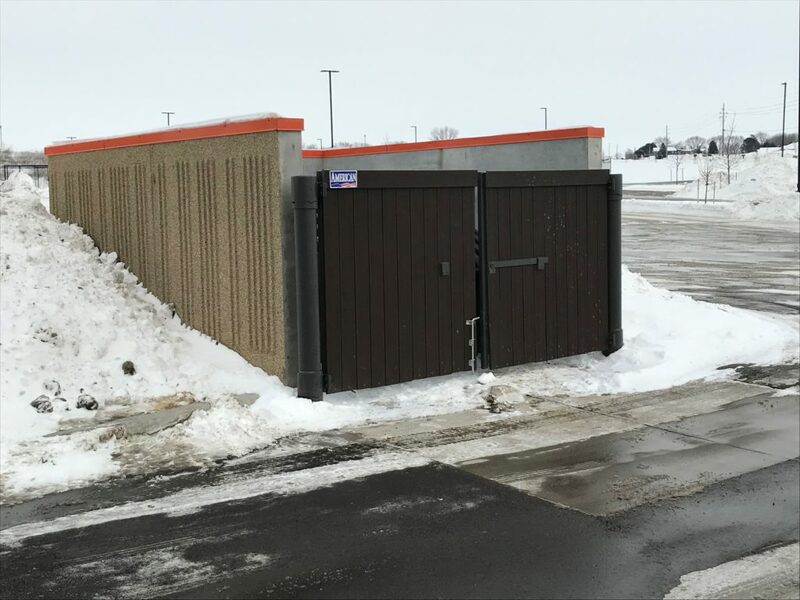 Not just Sioux City, but all of our American Fence Company branches have expertise in the design and installation of specialty dumpster enclosures. Our branches team with the corporate custom metals division, PalmSHIELD, to provide professional-grade architectural finished dumpster enclosures. These enclosures have a fully framed panel design that can incorporate horizontal aluminum, composite or vinyl tongue and groove infill panels. These dumpster enclosures dazzle with smooth exterior finish and aluminum frame and columns. There are a large variety of colors and textures available for our various infill options and all of the posts and panels and posts are media blasted and powder coated.